Lose up to 16 Pounds in 14 Days and Sip Your Way to A Lean & Healthy You! 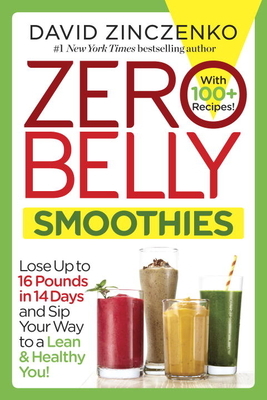 NEW YORK TIMES BESTSELLER • Lose up to 16 Pounds in 14 Days with Zero Belly Smoothies! Watch the pounds disappear—with the press of a button! That’s all it takes to blend up a Zero Belly Smoothie, a unique mix of supernutrients that will flatten your gut, boost your metabolism, heal your digestive system, and turn off your fat genes for good. With fat-burning proteins and a specially selected array of high-powered fruits and vegetables, Zero Belly Smoothies—based on the New York Times bestseller Zero Belly Diet—are the fastest and most delicious ways ever created to sip off the pounds! Inside you’ll find a complete shopping guide, a bonus cleanse program, and more than 100 intensely flavorful recipes, including tasty green drinks, fresh and fruity smoothies, nutty, chocolatey shakes, and savory surprises. • Lose up to 16 pounds in 14 days. • Melt away stubborn fat, from your belly first. • Put an end to bloating and discomfort. • Detox from unhealthy foods so you enjoy all-day energy. • Turn off your fat storage genes and make long-term weight loss effortless. • Look and feel younger and healthier than ever! Bob McMicken, 51, lost 16.3 pounds. Kyle Cambridge, 28, lost 15 pounds. Martha Chesler, 54, lost 11 pounds. Matt Brunner, 43, lost 14 pounds. 1. They take the stress out of cooking and eating well. Studies have shown that the more diverse your diet, the more likely you are to experience weight gain. In fact, those who ate the widest range of foods showed a 120 percent greater increase in waist circumference compared with those who had the least diversity. In other words, people who have the best success at weight loss pick a set number of foods and tend to stick to them. Zero Belly Smoothies allow you to do exactly that. 2. They crowd out the junk in your diet. Zero Belly Smoothies come in all different flavors—chocolatey, fruity, green, and even savory—but they all have one thing in common: no added sugars. In a 2015 study in Sweden, researchers followed 42,400 men over the course of 12 years. They found that men who consumed at least two servings per day of sweetened beverages had a 23 percent higher risk of heart failure compared with those who did not. 3. They battle food allergies and reduce inflammation. What’s also unique about Zero Belly Smoothies is that they are vegan: no milk, no yogurt, no whey protein. Plant-based protein powders are a low-sugar, high-fiber alternative to popular dairy-based supplements. A study by the University of Tampa that compared plant protein with whey found it to be equally as effective at changing body composition and boosting muscle recovery and growth! 4. They make you feel fuller longer! Studies show that high-protein smoothies are highly effective at rushing nutrients to your muscles and that blended fruit drinks, which include all the fiber, will actually keep you fuller longer than fruit juices. David Zinczenko is the #1 New York Times bestselling author of Zero Belly Diet, Zero Belly Cookbook, Zero Belly Smoothies, and Zero Belly Breakfasts, and the co-author of the Eat This, Not That! franchise (which has sold more than eight million copies worldwide) and the Abs Diet book series. He is a health and wellness contributor at NBC News and has appeared on Today, Good Morning America, The Oprah Winfrey Show, and Rachael Ray and is the award-winning former editor in chief of Men’s Health and editorial director of Women’s Health, Prevention, and Best Life magazines. Zinczenko is also the founder and chief executive of Galvanized Media, where he oversees a number of life-changing wellness brands. He lives in New York City.